Holiday's are Happier with Saving! Holiday Savings are Here!! Read the blog post for the Coupon Codes. In Honor of Breast Cancer Awareness Month Everything Pink is on SALE! In honor of breast cancer awareness month everything pink is on sale up to 25% off for the whole month of October! It's time to put pink on your ponies to show your support. Don’t forget to check out our awareness stencil!! Celebrate the Happy Holidays with Savings! No orders will ship until November 16th. The gelding in Glitter makes a new friend! Spring is here and the Denali is getting lots of visitors! Spring Sale Pick your Coupon code for orders over $35. Spring17 for free shipping or S&S17 for 20% off your order. Join us on social media to win free stuff! Follow Twinkle Products on Instagram and Facebook for a chance to win a stencil kit and Twinkle gel of your choice. the winner will be selected on March 1st. We would like to announce our winner, Danaee! We hope you enjoy the product. Everyone look out for our next giveaway! Save the way you want! pick your code and save Firday November 25th thru Monday november 28th! Twinkle was so honored to participate in the Central Oregon Chapter of the Oregon Dressage Society's October Ride for a Cause schooling show. This year the cause was Breast cancer and proceeds of the show went to support Sara's Project. Now all Pink items are on sale! The Gelding in Glitter is now 4 and went to his first show! Rainbow dust spray is now available in a 16oz bottle and in a new color. Use Coupon code Spring16 at check out and your order over $25 ships free with in the Continental US. Stock up and Save with Free Shipping! Twinkle recently did a new photo shoot. The images will be coming to the website soon but we're so excited we had to share some early. Today's product is the Rainbow Dust Spray, easy and quick to apply, maybe too easy because I wear it every day! The 4th of July is right around the corner and it is time to sport your red, white and blue. In celebration of our independence enjoy free shipping on us for all orders over $50 until July 7th. Just use coupon code 4thfreeship at check out! Hi my name is Denali. 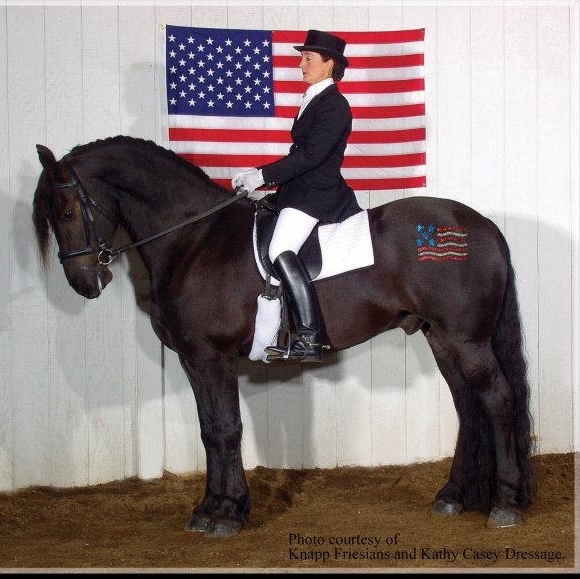 I’m a three year old Friesian sport horse gelding. I was rescued at 9 months old.